Cooking a whole chicken is beneficial for so many reasons. It’s affordable, as whole chickens are cheaper per pound than butchered white or dark meat, you can squeeze more nutrients from it by using the bones, and using all parts of the bird helps to reduce food waste. In this post, I’m sharing my favorite ways to use a whole chicken. The average price I pay for a grain-fed chicken is about $12 - $15 (CAD), and I will get 3 meals for 2 people out of that one bird. That’s excellent value as far as I’m concerned. To prepare, pat the chicken dry with a paper towel and rub it with olive oil, salt, and pepper. Place it into a dutch oven and roast at 375F for an hour with the lid on, then turn the oven up to 400F and roast for 20 minutes. If you leave the lid off for the last portion it will turn nicely golden brown. Let the chicken come to room temperature so you can work with it (without burning yourself!). Remove the legs and breasts. 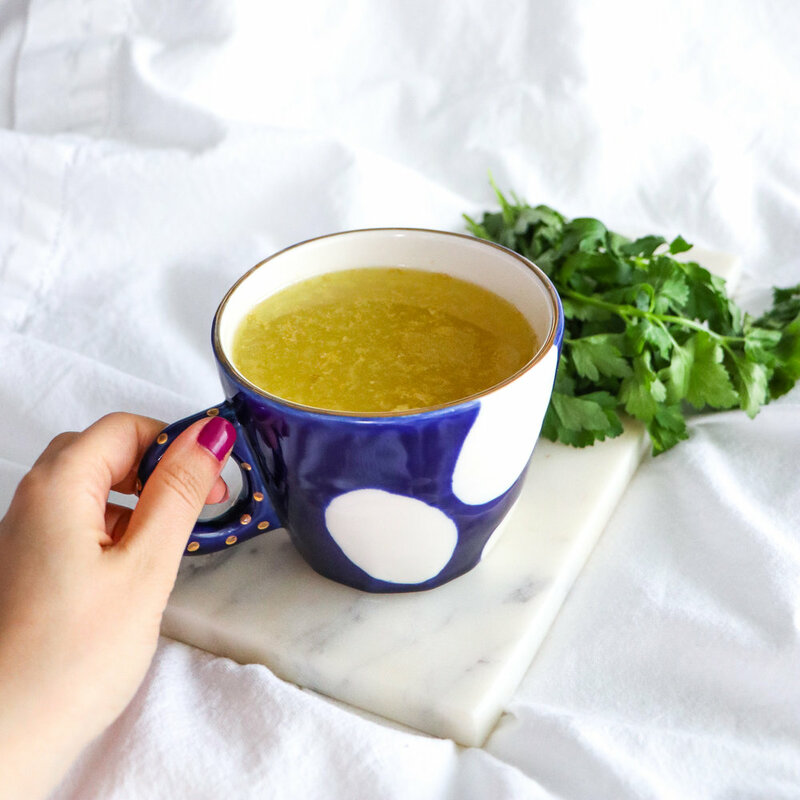 Create a delicious and collagen rich bone broth with the chicken bones. Place the whole carcass into a stock pot. Be sure to remove any butcher’s twine. Season with about 1/2 tsp sea salt. You can add a whole carrot, a tomato, a piece of celery, a bay leaf, or whatever flavorings you prefer. Cover the bird with water, put the lid on, and bring up to a boil. Then turn down and let simmer on medium heat for at least 3-4 hours (I aim for 8 - 10 whenever possible) with the lid slightly askew. Although chicken bones are not as high in collagen as beef bones, they still make a tasty bone broth and do contain both collagen and gelatin. Strain the broth through a sieve to remove all the pieces. Store it in a mason jar or glass jug in the fridge for up to 3 days. I use this broth for soup, as a liquid when cooking rice or other grains, or I drink it from a mug like a tasty cup of chicken tea. Leave all that golden coloured fat and olive oil in the bottom of the dutch oven. There may even be some straggling bits of meat left behind, or dark, caramelized bits of fat. Finely slice up one and a half yellow onions and toss them into the pot. Season with salt. Sweat the onions down in the fat on low heat for about a half hour. Stir often to prevent sticking. They will turn a shade of translucent golden brown. Scoop them onto a crispy piece of toast or a bagel for a super treat. Or, serve as a condiment with meat or veggies for dinner. The dark and white meat can be packaged up in a glass or plastic container and stored in the fridge for up to 3 days. Use this meat for literally anything! Since the method of roasting that I described above does not make the skin super crispy, I like to oil or sauce the dark meat and give it a quick broil in the oven to create a crunchy outer layer. The breast meat is incredibly moist and can be chopped up and added to salads, pasta, stir-fry’s, soups, and more! In the photo below, I pulled apart the dark meat and added it to a fresh tomato sauce along with lemon juice, cilantro, and crispy prosciutto. Then I garnished the top with half a ripe avocado. It’s an easy and convenient way to have protein on hand in your fridge, without doing full meal prep.